They found that, without changes to farm policy and improvements to agricultural technology, the nation’s productivity in 2050 could look like it did in 1980. That’s because at the present rates of innovation, new technologies won’t be able to keep up with the damage caused by the changes in climate in our major growing regions. Lead author Xin-Zhong Liang, a professor at the University of Maryland, says both policymakers and those who work directly in agriculture should consider changes that might prevent this drop. On the policy side, Liang said, changes to water management could help. On the technology side, the development of seeds that can withstand more extremes of heat and rain would likely help mitigate the climate’s impact on overall productivity. But, he adds, such advances will need to come at a faster pace than they have in the past. The new research identifies the Corn Belt as the region where the changes could have the biggest impact on overall productivity, with California and the Southwest region second in line. The transition area from the Corn Belt into the southern cotton and pasture region is also vulnerable. 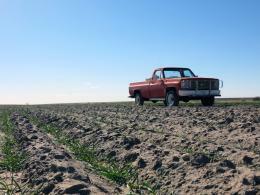 Losses in U.S. production could impact the global food supply. This research, Liang says, enhances existing studies to offer a more robust picture of how total agricultural output of the country could change under different climate change scenarios.